A good book is good; five is even better. In this next instalment of our Five Books series, Simon Cuff recommends his favourite books on Catholic Social Teaching. Fr Simon is Tutor and Lecturer in Political Theology at St Melitus College. He is the author of Love In Action: Catholic Social Teaching For Every Church (London: SCM 2019). Catholic Social Teaching has been described as the Roman Catholic Church’s best kept secret [1, 2]. It is a rich body of thought, the fruit of the Roman Catholic Church carefully applying the demands of the Gospel in the midst of ever-changing social and political contexts. It finds its origins in Europe at the end of the 19th Century and continues to be worked out today, with recent interventions by Pope Francis developing this body of teaching and reflection on how the Gospel is to be preached in an increasingly globalised world. At its heart, Catholic Social Teaching is about the restoration and reconciliation of relationships which Christ brings. The Archbishop of Canterbury describes it as ‘the applied outworking of the good news of Jesus Christ in terms of social structures and social justice’ . Catholic Social Teaching stems from a foundational encyclical written in 1891, often referred to by it Latin’s title, Rerum Novarum - ‘of new things’. An encyclical is a letter written by the Pope, more normally addressed to those bishops in communion with the Holy See, but often intended to impact a wider audience by setting out a body of teaching on whatever matter the Pope writes. The encyclical Rerum Novarum enjoys an almost mythic status in the world of Catholic Social Teaching. The ‘new things’ in the title of Rerum Novarum are the sweeping social and economic changes which were occupying the minds and lives of many in newly industrialised Western nations at the end of the 19th Century. Standing in the first decades of the 21st Century, we find ourselves in the midst of similarly widespread social and economic flux. In this context, the insights of Catholic Social Teaching are especially pertinent. They have much to offer every Church as churches try to negotiate and build up the body of Christ in the midst of sweeping social and economic change. Catholic Social Teaching has developed out of more than a century of reflection on the demands of this Christian life on ever-changing social and political conditions. Arising out of this reflection, various principles have been distilled which enable the application of Catholic Social Teaching to every church and context. The inalienable dignity of each and every human being has its basis in the fact of our creation by and in the image of God. The common good is that which builds up the entire human race. The relationships between each of us make up the solidarity which strengthens the human race and builds up the body of Christ. The relationships within and across that race and body, and the intermediary groups which mediate between the individual and the whole constitute subsidiarity, which keeps the power of decision-making close to those affected by any decision to be made. Where these decisions are exercised poorly or selfishly, or in the interest of certain individuals or parts of the body, we see the effect of social sin. Such sin is part of the world of competing interests in which we live, where conflicting claims and interests can be made on the same resources. In deciding between such claims, the preferential option for the poor reminds the whole of the human race that it focussing on the poorest members of that race enables the flourishing of all. It should be obvious that in combination these principles strengthen the flourishing of the entire human race, and enable every member to live out the abundance of human life to which God wills us all. This is as true of the body of Christ, as of the human race as a whole. There are a myriad of books devoted to Catholic Social Teaching and its principles. Authors have to choose between introducing the subject historically, document by document, or thematically, by unpicking the principles and themes that have emerged from this body of thought. The five books below offer various approaches and entry levels into Catholic Social Teaching, and each more or less helps us to think how we might apply the principles of Catholic Social Teaching within our own lives and churches, ranked in order of readability (most to arguably least). Some are introductions to Catholic Social Teaching and its principles, others the story of a life lived according to those principles or how we might go about beginning to live that life, and so enjoy a world transformed. For those of us who are Anglican, the Archbishop of Canterbury’s, Reimagining Britain, includes some sustained reflection on how Catholic Social Teaching might be lived out in a British context. This book isn’t strictly a book about Catholic Social Teaching, which is why it’s first on our list. An Alley in Chicago is an inspirational biography about the life of Mgr John ‘Jack’ Egan (1916 - 2001). Fr Jack Egan lived and ministered through, and in response to, the major developments within Catholic Social Teaching across the end of the 20th Century. He was formed in the Catholic powerhouse of mid-20th Century Chicago, in a tradition which was coming to terms with the consequences of the rediscovery of the doctrine of the Church as the mystical body of Christ. Reflection on this doctrine lay behind some of the major themes of Catholic ecclesiology that came out of the Second Vatican Council, but also inspired a generation of Catholic clergy and laity to live out their vocation as part of that body. Mgr Jack Egan was the forefront of such ministry. He was also a pioneer in relating Catholic theory to practice. He was a key influence on the development of the craft of community organising through his deep personal relationship with the community organiser and civil rights campaigner, Saul Alinsky. Read this book if you are considering your catholic vocation, or if you’re ordained and you want to reignite the fire in your belly for living out the radical social challenge of the Gospel. As a popular biography, it’s extremely readable. It’s a sign of how quickly the world moves on, that this book is already a little dated in some areas. However, it remains one of the most accessible introductions to Catholic Social Teaching, with clear chapters and a helpful appendix that sets out the principles in an easily approachable format. Faithful Citizens is Austen Ivereigh’s introduction Catholic Social Teaching for a new audience. He unpacks how the principles of Catholic Social Teaching might be applied in daily life through the practice of community organising. Community organising is a set of tools developed by Saul Alinsky, designed to encourage and enable effective action for social justice and the common good. Its form and origins are heavily indebted to important figures within the development of Catholic Social Teaching. Read this if you want to know to read a guide to how to apply the principles of Catholic Social Teaching in your context or community. This book is, literally, a magisterial resource on the Social Teaching of the Roman Catholic Church. Its size and scope might be off-putting at first, but each section is written in the style of all magisterial documents, which combine a direct and fairly easy-to-follow prose style, with detailed references for further reading. The Compendium sought to bring together the threads of Catholic Social thought into one place after a century or more of reflection. It was written in part due to some criticism that the revision of the Catechism under emphasised the social responsibility of living the Gospel. The Compendium sets out the clear social responsibility of those who seek to follow the call of the one proclaimed in the Good News, and how that Good News can be experienced by everyone in their present realities. It is exhaustive, with sections devoted to foreign debt, the fight against poverty, disarmament, lay faithful and more besides. Don’t be put off by it’s breadth, each can be read in isolation as you think or reflection on the particular issue at hand. It makes an excellent resource for discussion in small groups. A copy should be on everyone’s bookshelf! Read this if Catholic Social Teaching is your thing, and if you want a resource that will stand the test of time to fuel your thinking on how to live out the Gospel in the world and in relationship with the entire Body of Christ and all people of good will. 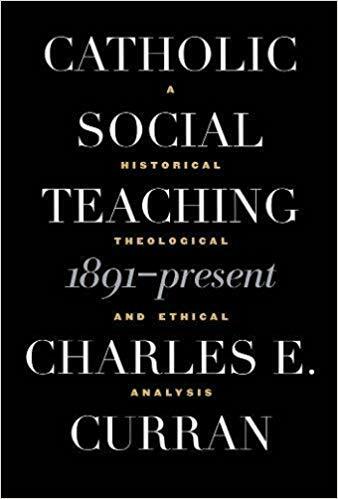 If the breadth of the Compendium makes your head spin a little, and you prefer a more discipline thematic approach, Charles Curran’s Catholic Social Teaching might help you find your way. It’s the closest to a textbook on Catholic Social Teaching available. Curran’s book is in two halves. The first searches for the underlying methodology of Catholic Social Teaching, and identifies three areas where distinct methodologies can be observed: theological, ethical, and ecclesial. This approach is useful as it means that the underlying methodology of Catholic Social Teaching is drawn out, and the possibilities for application are made clear. The second half looks at the content of Catholic Social Teaching. Each chapter is broad in its scope, focussing on the anthropological, economic, and political aspects of Catholic Social Teaching. Read this book if you want to understand the theoretical background to Catholic Social Teaching, if you like material presented thematically, and if you want to search behind the documents of Catholic Social Teaching in order to understand how to apply Catholic Social Teaching well in your own discipleship or community. This book is a series of articles written by academic specialists, practitioners and advocates of Catholic Social Teaching. The authors are united in the conviction that living out the principles of Catholic Social Teaching is not just a matter of moral consequence, but will also have practical and visible consequences in driving up prosperity, reduce inequality, and make for a sustainable global economy in which the poor and marginalised might take their rightful place. The volume combines historical reflection on the role of Catholic Social Teaching in driving development across the 20th Century, economic and political analysis of the potential of Catholic Social Teaching, and a final chapter attempts to spell out steps for putting Catholic Social Teaching in to practice. Some of the claims made for the role that Catholic Social Teaching has played in the past are slightly over-stretched, but this shouldn’t put you off. The potential for Catholic Social Teaching to bear fruit in the future shouldn’t be understimated. Action speaks louder than words. Read this book if you want to see Catholic Social Teaching applied from a range of academic disciplines to the practical political and economic problems of our day, and go and do likewise! DeBerri, E. P.; Jug, J. E. with Henriot, P. J.; Schulthreis, M. J. (1988). Catholic Social Teaching: Our Best Kept Secret (Maryknoll, NY: Orbis Books). Walsh, M. (2012). The Myth of Rerum Novarum. New Blackfriars 93, 155-162. Sep 19 God and Emotions series -- "God's Justice, God's Mercy"